PLO official claims that recognizing Israel as a Jewish state would "deny the Palestinians' rights." Palestine Liberation Organization (PLO) official Hanan Ashrawi said on Saturday that Israel's demand that the PA recognize it as a Jewish state is an attempt to “legalize racism,” reports the Ma’an news agency. 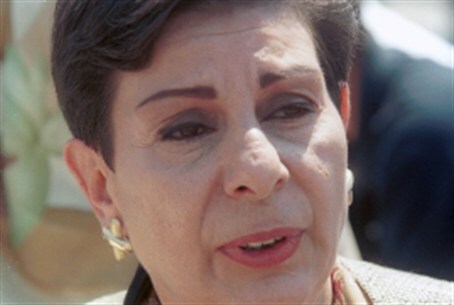 Ashrawi, a member of the PLO’s Executive Committee, said that defining Israel as a Jewish state would signify that any Jewish person would have the right to return to “Palestine”, while Palestinian Arabs would lose that right. Israel wants to "create a narrative that denies the Palestinian presence, rights, and continuity on the historic Palestinian lands," she charged, in a conversation with Ma’an. She also claimed that a "Jewish state" recognition would exempt Israel from its responsibility towards the so-called “Palestinian refugees” who fled their homes in 1948. The Fatah party, headed by PA Chairman Mahmoud Abbas, has repeatedly stressed that the PA will never give up on the so-called “right of return”. Abbas had previously made statements indicating that in a peace agreement with Israel he would be willing to give up on this demand, but was quick to cave in to public pressure and retract these claims. Prime Minister Binyamin Netanyahu has repeatedly demanded PA recognition of Israel as a Jewish state, noting that the PA’s refusal to recognize Israel is the root of the decades-long conflict. Not only has Abbas refused to recognize Israel, the PA regularly incites against Israel in official media, even as peace talks have resumed.